Here you will learn how to set up an autoresponder and grow your email list automatically in WordPress. Oh, and did I mention – it’s completely free. In this tutorial I will show you how you can attract new subscribers automatically with lead magnets, that you include in your posts. You can grow your email list by offerring something valuable to your readers for free in exchange for their email address. This can be a free E-book, a sort of action plan or summurized version of your article. After they susbcribe to your list, the autoresponder sends them immediately the promissed book or pdf file. This way, if your blog has more than 1 main topics you will be able to target your visitors according to their interests, instead of trying to guess why they subscribed to your email list. We will use MailPoet Newsletters plugin with which you can create automated emails, that your readers will receive immediately after they sign up for your email list. To be able to show a popup with your newsletter form in each article we will use Lead Magnets. This is a plugin that I wrote to help you grow your email list more efficiently – by showing your newsletter subscription form to your visitors after you get the first “Yes” from them. Lead Magnets is very lightweight, so it won’t slow down your website. After you install both plugins we will create our first Autoresponder campaign. Go to your WordPress admin screen, MailPoet -> Subscribers -> Add List and create new list. Give it a name and then move to Newsletters submenu under MailPoet. Here we will create our first Automatic newsletter. Click on Create New Email at the top and select Automatic newsletter next to What type of newsletter is this? Now you can select when this email should be sent to your list of subscribers. In this tutorial we will send a new email immediately after someone subscribes to our newly created list – Grow your email. Then we can add the subject line and procceed with creating the email. In the next step you will be able to write the actual body of your email. Here you can also send a test email to yourself. In the last step you are able to check whether the subject line, sender name and reply to email are correct and activate your automatic email. 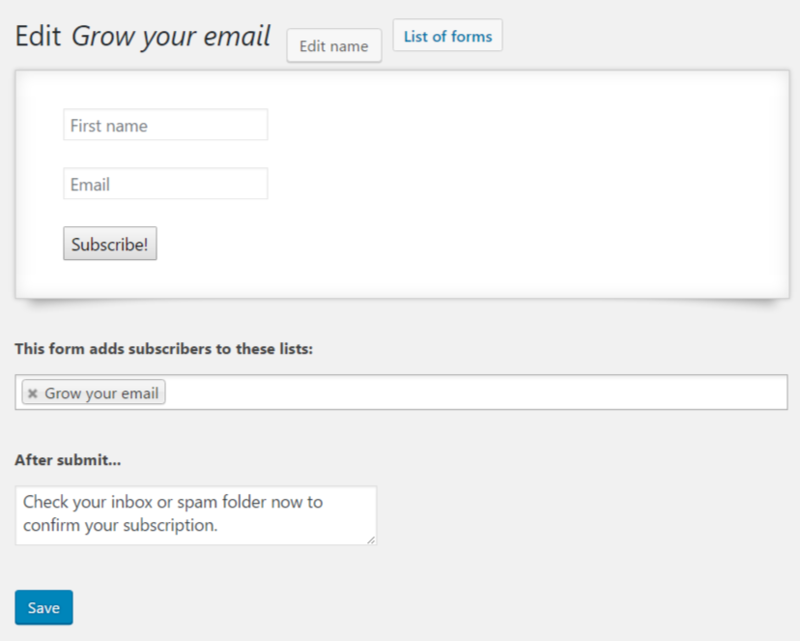 Once it’s active, we can create a new subscription form, which will collect all emails to our list. Go to MailPoet -> Settings -> Forms and create a new form. In this form we will collect user’s First Name and Email address. I have also edited the display of each field and selected “Yes”, for Display label within input. Save the form, now we are ready to add it to our article. This is where Lead Magnets comes to help. After installing Lead Magnets, on your Add/Edit Post screen you will see its icon up in the WordPress Visual Editor. From here you can add 3 shortcodes: Attention, Lead Magnet Link and Lead Magnet Popup. The Attention schortcode will wrap your Lead Magnet link in a block with gray background color. You can choose to skip this shortcode as well. The next shortcode is Lead Magnet link. Here you have to place your CTA (Call-to-Action). When your visitor clicks on it, the Lead Magnet popup will appear, containing the newsletter subscription form we just created in MailPoet. Here we will have to add our custom title, subtitle and insert the shortcode for MailPoet form. You can customize the spam statement and the text on the close button as well. First we’ve added the link and then the popup. Now, click here to see it in action. I hope this tutorial has helped you a lot. Feel free to share it with someone, whom you think it might help.